Here are some behind the scenes photos taken by John C. Sherwood of Hatari's historic Milk Can escape at the 2015 Midwest Magic History Weekend. 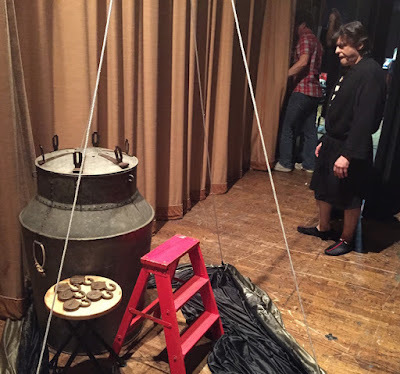 The American Museum of Magic allowed use of their authentic Houdini-Hardeen Milk Can for this one performance only. Looks at home on a stage, doesn't it? John posted these to Facebook and now generously allows me to share them here. I've include John's captions below. Just before showtime at the Franke Center, Hatari contemplates how he might escape from Houdini's Milk Can. Four minutes to curtain ... ! 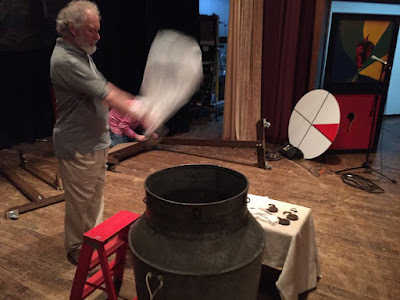 Phillip Hagerty conjures the ectoplasmic presence of Harry Houdini on Saturday afternoon to advise us what to tell Hatari prior to his escape attempt from Harry's old Milk Can. As usual, HH was mum, so we figured it out ourselves just in time to please a demanding Marshall audience! The news you've been waiting for: Yes, Hatari (right) successfully extricated himself from Houdini's securely padlocked Milk Can on Saturday night. There were screams and thrills and no small amount of apprehension, but this New Jersey gentleman knows how to handle himself when confronted by the Unknown. 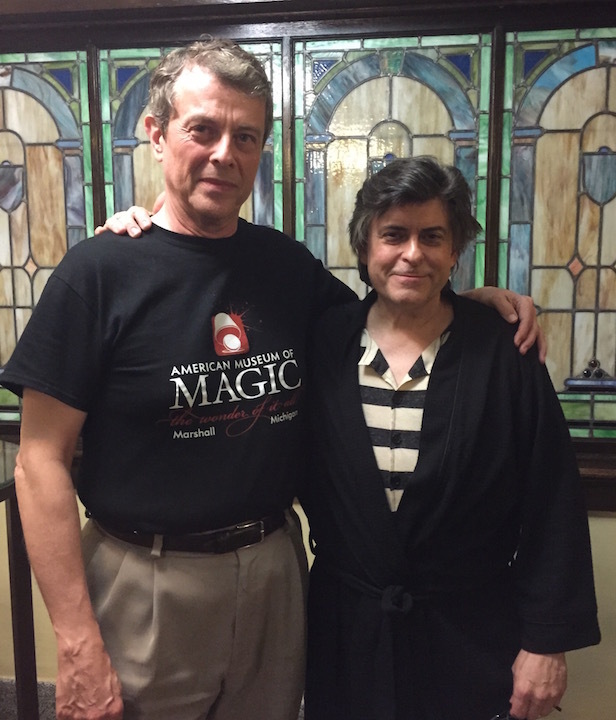 Hatari (Joe Patire) is my new favorite escapologist, and the Franke Center and the American Museum of Magic thank him for his contribution to an eventful week of miracle-making! Click to read my full report on the Midwest Magic History Weekend. I take it there was no WATER in the can. I remember seeing this can oh so many years ago and hearing Bob Lund talk about it. Yeah, I addressed that, and David left a very detailed comment in this post HERE. By the slope of its shoulders this looks like Hardeens can as he last performed it. The Houdini can did not look lik this one correct? It definitely matches the can we see in pics of Hardeen. This is actually one of two identical cans (the other is in a private collection). The only can Houdini is pictured with doesn't match any in existence as it has handles on the shoulders. But he had more than one can, to be sure. This was also the can that toured with Houdini Art & Magic exhibit a few years back. Hold on. Are we saying that the can Houdini was pictured with is no longer in existence? Where would it have gone? The duplicate can is in the Copperfield collection correct? It could be the handles were removed and the Can is the one in the Copperfield collection. They do look similar. But, yeah, that's the great Milk Can conundrum. The only Houdini can we have photographic evidence for doesn't exactly match any of the existing cans. It's much more than handles I believe. The slope of the neck of the Houdini can is very different from the Hardeen can. The slope of the can in the Copperfield collection is similar to the can we see in the pic of Houdini. Yes, they are both different from this Hardeen can. 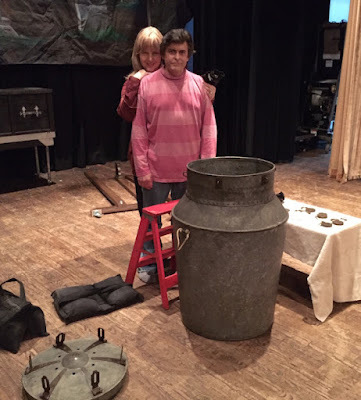 There is a photo of two people unpacking the Houdini can at the Appleton Houdini museum. This can looks like the Houdini can. The slops of its neck looks just like the can we see Houdini posing next to. The handles have been moved however. So how many cans exist that we know of. Looks like there is three? Appleton, Cooperfield and the can above? The Appleton can is the Copperfield can. Sid Radner owned it when it was on show in Appleton. Copperfield bought it later. There are many cans. Check out THIS POST by Dean Carnegie. The Copperfield can looks very much like the Houdini can with handles removed. I read somewhere that Houdini had the handles removed since the location of the handles suggested the can came apart at the shoulder. I only know of two Houdini Milk Can photos: HH posing next to the can in the dark tank top bathing suit, and the follow up with the three police officers putting on the lid while HH is peeking from the top. Obviously, the can wasn't filled with water for those shots. I know that HH performed the Milk Can when he toured Australia in 1909, but how long after that did it stay in rotation? The imitators didn't waste time because HH dropped it fairly soon after 1908. Jean Hugard was among those imitators who performed the can. I believe it stayed in rotation for much longer than we think, maybe even his entire career. We know he's did the Double Fold in 1914 at Hammersteins. I think he would occasional swap out the USD for the Milk Can, maybe when it wasn't practical to stage the USD. It wouldn't surprise me if we learned he did the Double Fold in his 3 Shows in One on occasion. He definitely performed the Milk Can (aka Galvanised iron can, filled to the brim with water and locked with six padlocks) during his 1920 final tour in Great Britain. Okay, so the can never really left. HH kept it in and out of rotation, and sometimes as a back up to the USD. Joe, was that galvanized can a milk can or something different? We also know HH performed the USD during that final tour of Great Britain. The "galvanized iron can" is the Milk Can. It's just how it was billed sometimes. Was it really ever advertised as The Milk Can?